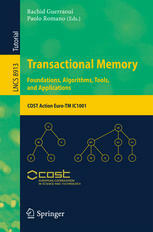 The Euro-TM COST Action is glad to announce it final publication! This book emerged from the idea to have Euro-TM experts compile recent results in the TM area in a single and consistent volume. The book contains 20 chapters, which were co-authored by 60 researchers from 13 countries. Contributions have been carefully selected and revised to provide a broad coverage of several fundamental issues associated with the design and implementation of TM systems, including their theoretical underpinnings and algorithmic foundations, programming language integration and verification tools, hardware supports, distributed TMs, self-tuning mechanisms, as well as lessons learnt from building complex TM-based applications. The book provides a unique collection of tutorials, which will allow graduate students in computer science to get familiar with state-of-the-art research in TM and its applications, typically along their road to doctoral studies. At this URL the book will be available free of charge till end of January!